Those pilgrims traveling from afar are strongly advised to arrive the day before Friday’s pre-dawn rendezvous and step-off; i.e., they do well to arrive Thursday afternoon or evening. Arrival Points & Accommodations page for pilgrim-friendly accommodations near the step-off location Friday. For pilgrims arriving & departing by air or rail, and — for those driving — in order to retrieve their vehicles at the conclusion of the pilgrimage, a shuttle is provided Thursday only to the step-off location & accommodations in Lake George Village. Those expecting to use the shuttle must submit their request by September 21, in order to guarantee transport. Click here to submit your or your travel-party’s shuttle request. Every pilgrim without exception must check-in upon arrival — whether Thursday afternoon or evening, or early Friday morning. There are two opportunities to check-in on Thursday, and only one very early Friday morning. a. At 16:30 – approx. 20:30 hours Thursday early-bird check-in commences at the Lake George Battleground Campground, in front of the public restrooms in the Lake George Battleground Campground, behind the monument to St. Isaac Jogues. b. At 21:00 – 22:30pm hours Thursday check-in continues at Cramer’s Point Motel & Cottages. At 22:30 hrs (10:30pm) check-in personnel retire for the night … and so should all other pilgrims! c. Any pilgrim arriving after 22:30 (10:30pm) Thursday must check-in 05:45 Friday morning at the rendezvous location; the parking lot at the “Million Dollar Beach”. 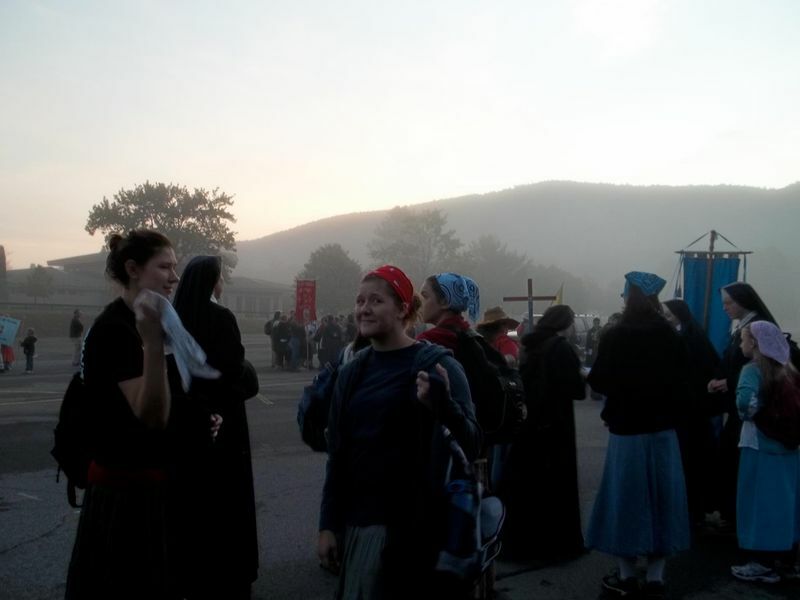 05:45 – all pilgrims rendezvous at the “Million Dollar Beach” parking lot directly at the Lake of the Blessed Sacrament, (re)forming-up with their brigades. Pilgrims who have not registered in advance — called “walk-ons” — must register with organizers, pay the walk-on rate registration fee ($150/pilgrim), and then also immediately check-in before joining their brigades. Pilgrims who have registered in advance but arrived late Thursday and were unable to check-in early must also quickly check-in with organizers at this time. Immediately upon completion of walk-on registration and last-minute check-in all pilgrims must join up with their waiting brigades. 18:15 – suppertime, washing & blister care, etc. 21:30 sharp – lights out! 18:30 – suppertime, washing, blister care, etc. NO STROLLERS may join up at the noon rendezvous point. Families & seniors of the modified Pilgrimage also re-join the column at this time. STROLLERS WELCOME to join up at the rendezvous point in Ft. Hunter. For more information about Sunday’s events only, please click here.